The title of this book is intriguing. At first glance, the main title seems to be about incarnation, the embodiment of the Word of God in the human flesh of Jesus. The subtitle, on the other hand seems to imply that the reader will be studying mere words rather than embodiment. For Peterson, however, there is no such thing as ‘mere’ words, at least, not in the life-challenging, life-enhancing way in which he encourages us to use them. 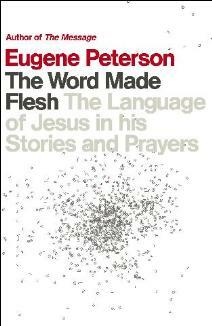 ‘Story and prayer are the core language of our humanity.’ This is a book of two halves. In the first, Peterson invites us to explore and reflect upon many of the parables which are recorded by Luke in Jesus’ journey to Jerusalem. In the second he invites us to get inside the prayers of Jesus. Each chapter offers a lively and fruitful opportunity to interact with the words of Jesus. Here are cameo commentaries on stories which Jesus told and prayers which he prayed – stimulation for preachers and nourishment for any reader who will involve themselves in the language of Jesus. It is a principle of incarnation that much of Jesus’ teaching is in the form of stories. Stories are personal and make us insiders to the place we live in and the people in it. Stories keep us close to the ground, alert to the voices around us, present to the silence. There are no formalities, no abstractions, no “big” truths. It’s not a language we use to map and decipher the world so that we can always know where we are, not a language that we use to command and control the world and the people in it. Rather, it is a language that provides room for ambiguity and presence, a language that brings us into a conversational participation with one another in this language-created, language-formed, Word-made-flesh world…. We will be on our guard against disincarnating our language into formulating ideas or summarizing rules of giving out information. So language, especially when it is used to tell stories, or when it unfolds in metaphor, has a way of embodying truth in such a way that we can describe it as ‘incarnational’: forgiveness which we encounter in the manure that is dug into the ground to give the fig tree yet another chance to grow and bear fruit; the experience of neighbourliness embedded in the violent crime and community politics of the Jericho road. Peterson reminds us of the importance of silence. In prayer, silence consists mostly in attentive listening and is nonnegotiable. Listening, which necessarily requires silence on our part, is as much a part of language as words. The colon and the semicolon, the comma and the period – all of which insist on silence as part and parcel of speech – are as essential to language as nouns and verbs. But more often than not, silence gets short shrift in our prayers. Yet if is there is no silence, our speech degenerates into babble. You don’t think you know how to pray? Yes, there is much to learn: meanwhile Jesus is praying for you. You don’t feel like praying? relax, feelings come and go; meanwhile Jesus is praying for you. You don’t have time to pray? Jesus doesn’t mind waiting: meanwhile he has plenty of time to pray for you.